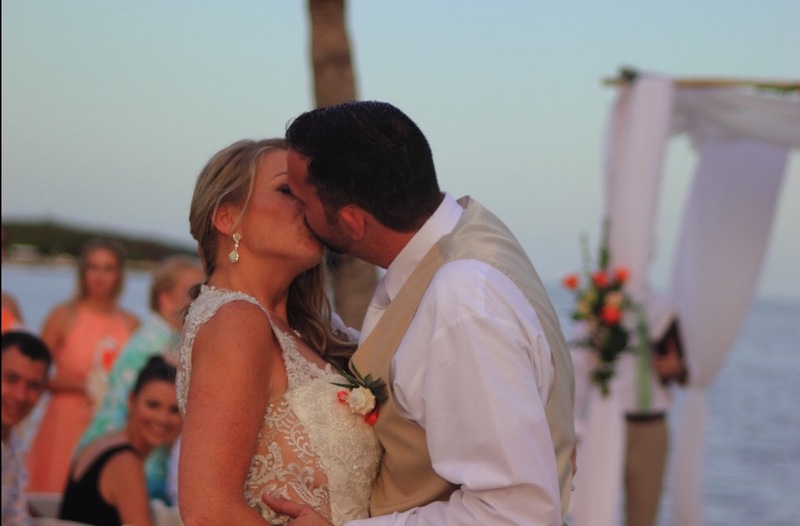 We sat down with another beautiful Wonderland bride to get her love story. 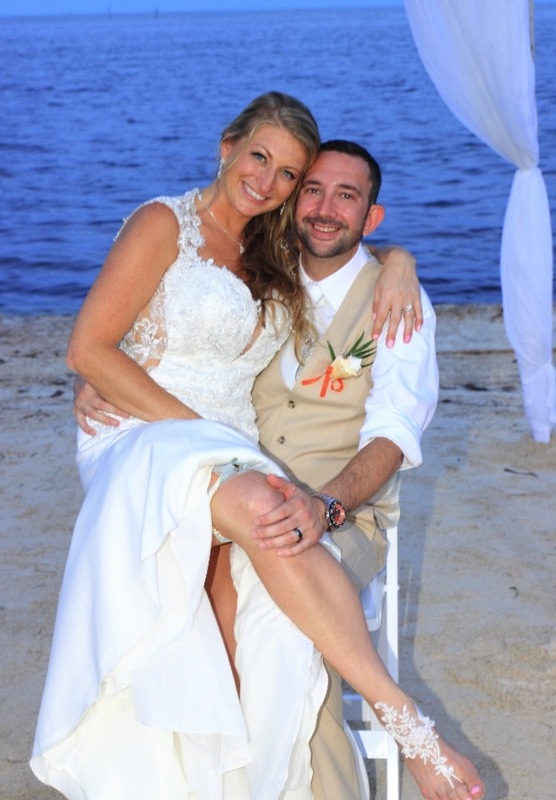 Meet Amanda & Roy, who were married October 7th, 2017. I had joined the dating site Okcupid after moving to FL in April. Roy messaged me at the end of June and hooked me by using quotes from Seinfeld, my favorite show. After several weeks of talking online and through text, we met for our first date at Tap 42 in Ft. Lauderdale. Afterwards we took a walk along the river walk, where we had our first kiss. On our second date we talked about what we wanted out of life (marriage and family). During Christmas shopping at the mall he attempted to take me in to Kay’s jewelers to look at rings but I was too anxious so quickly walked out of the store. Between Christmas and April we talked about our future together. In April we looked at rings so he could see what I liked. In July he asked my dad’s permission. In Aug he flew to long island to a family friend’s jeweler store to design the ring. The center diamond that was used was taken out of my grandmother’s wedding band that I had received from my parents several yrs ago. We went to the Naples Zoo and he had planned to propose on a boat ride around the monkey exhibit, however the boat broke down while we were in line waiting. Fast thinking had him take me to the Naples beach afterward to see the sunset. This is where he proposed. He asked a woman on the beach to take our picture and whispered that he wanted a video because he was going to propose. Coconut Cove in Islamorada, Fl. 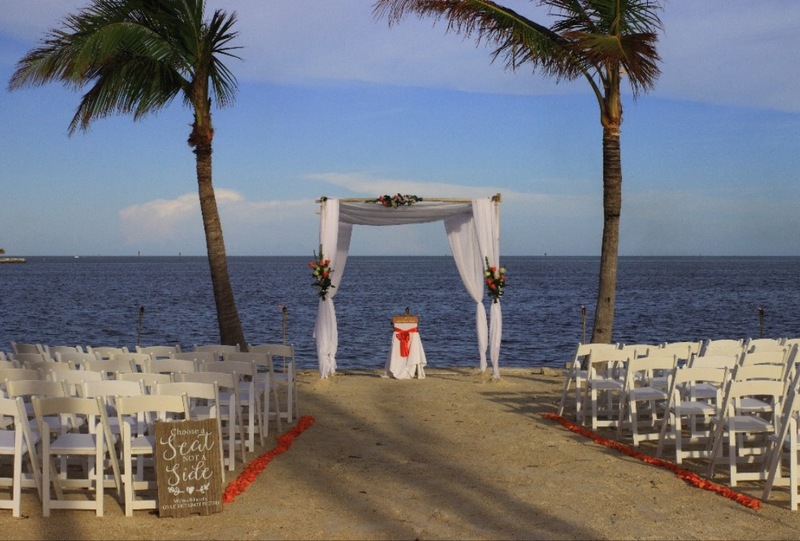 We chose this because its an all inclusive intimate private wedding resort, 10 miles from where Roy grew up. 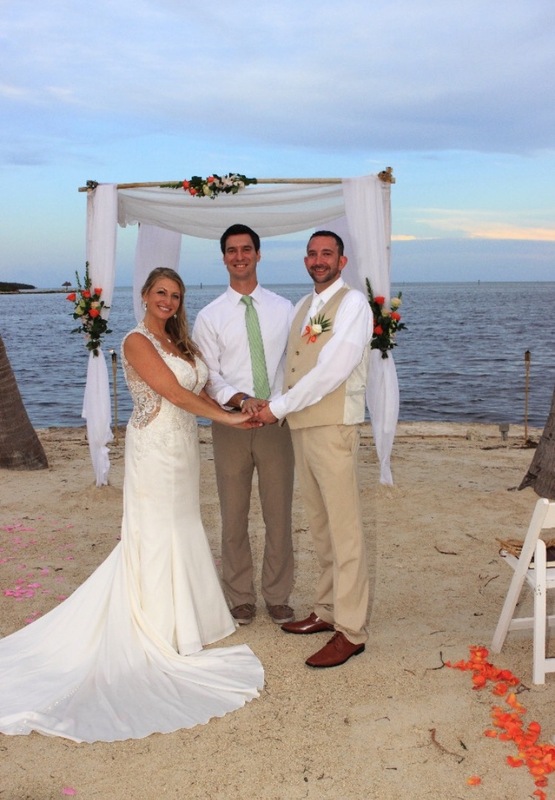 They have a beach space, tiki hut style reception space, and rooms for guests to stay. Only one wedding is conducted each wedding so there is no competition with other weddings or wedding crashers. 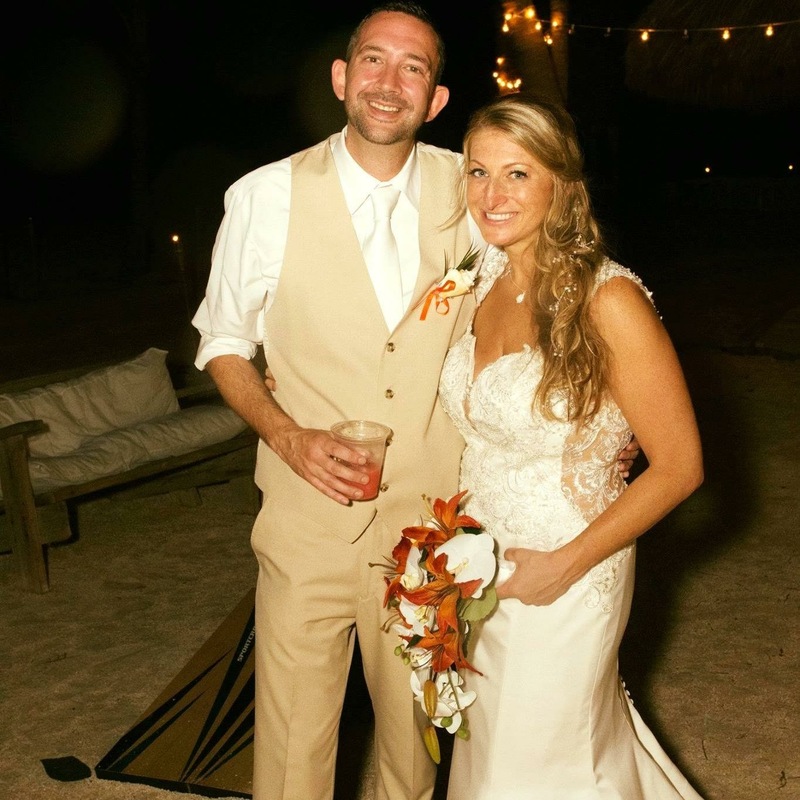 Travel/beach theme because we have a passion for traveling and this was a destination wedding for family and friends traveling from MI and Chicago. 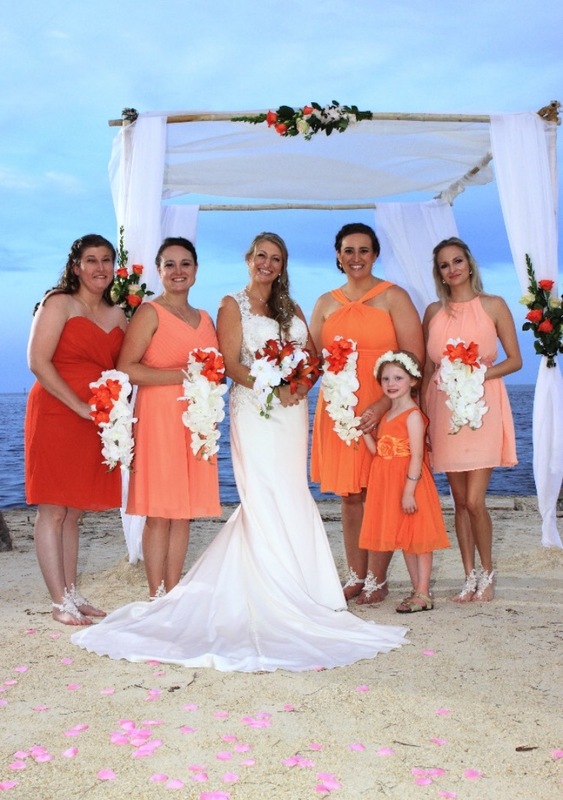 The main color was tangerine, with the bridesmaids choosing shades of orange for their dresses. Reviews on Wedding Wire, The Knot, and Yelp all suggested a very private and intimate experience, with one on one contact with the stylist. From the moment of walking through the door I knew I had made the right decision. I was welcomed with a smile and positive energy. I had my own dressing space with a welcome sign on the wall specialized with my name. Alicyn was accepting of what I wanted and didn’t want out of a dress. She knew exactly what would look great on me and I wasn’t disappointed. The 5th dress was THEE dress! Feeling overwhelmed with love for my husband, being surrounded by all my loved ones, and seeing everyones enjoyment at the reception. Realize that even though you have planned every detail something may still go wrong. And even if it does that is okay because the true meaning of your day is simply about you and your future husband. Keep in mind the true meaning of your day – Love! Cake: One naked layer with cupcakes. Key lime cake w/choc frosting and choc cake w/choc frosting. In honor of the pending nuptials of Prince Harry and Actress, Megan Markle we decided to dedicate this post to all of the brides looking to make their weddings a royal affair. After all, every bride wants to feel like a princess or queen on her special day. Here are a few tips on making your wedding worthy of the royal family. The monarchy in England hosts their wedding ceremonies in a church. Depending on the church or temple you choose, you may be required to cover your arms and have minimal cleavage. 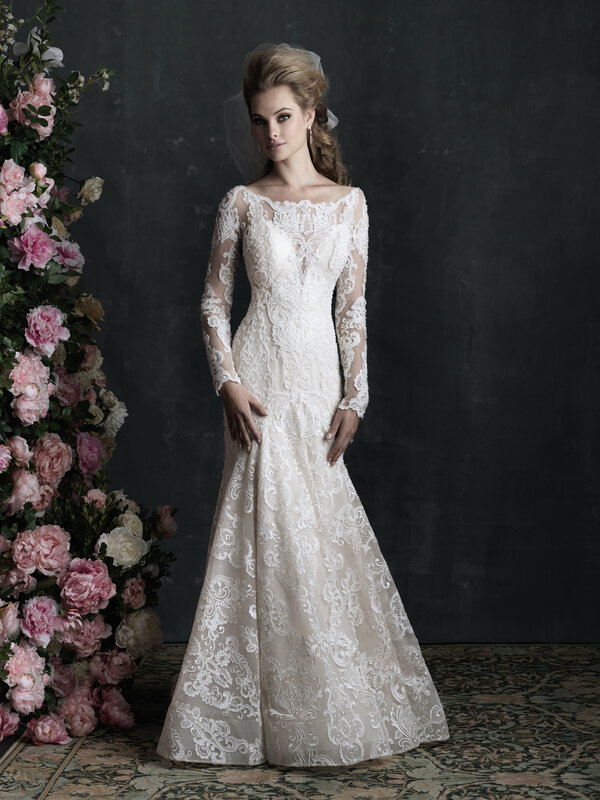 A sheer lace sleeve may be that touch of elegance you need to complete a conservative look. We like this dress from Allure Couture. Kate Middleton’s train was 9 ft long compared to Diana’s 25 ft long train. While that would make for a very heavy bustle, you can still have grand entrance with 3 1/2-4 ft train from a gown like this one from Stella York. If you want a smaller train but still want some drama, you can opt for a cathedral veil which will give you the length of a long train without having a bustle. Nothing completes the look of a princess like a Tiara. We love this one from Edward Berger for Mon Cheri. It can be ordered in silver or gold. Is a tiara not your style? 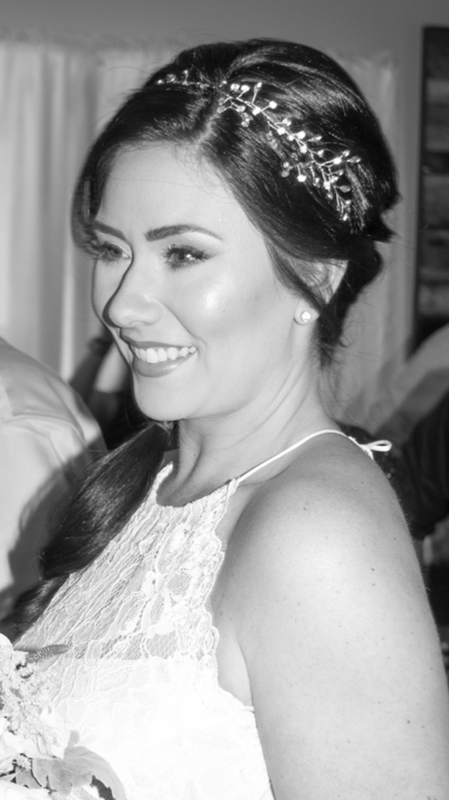 You can try a delicate headband that has all the sparkle of a traditional tiara with a softer look. We love this one from Jaxie Bridal. In choosing your color scheme you want to consider jewel tones like “Royal” Blue, Majestic Purple, and Cranberry Red. These colors get their reputation for being associated with royalty, power and wealth because of the price of the dyes used to produce it. In fact, Queen Elizabeth I forbade anyone except close members of the royal family to wear the color purple. We love these dresses from Sorella Vita. We at Wonderland Bridal are so excited to see what touches the Markle Sparkle will add to her wedding. We predict she will walk down the aisle in Stella McCartney. If she does, remember where you heard it first!